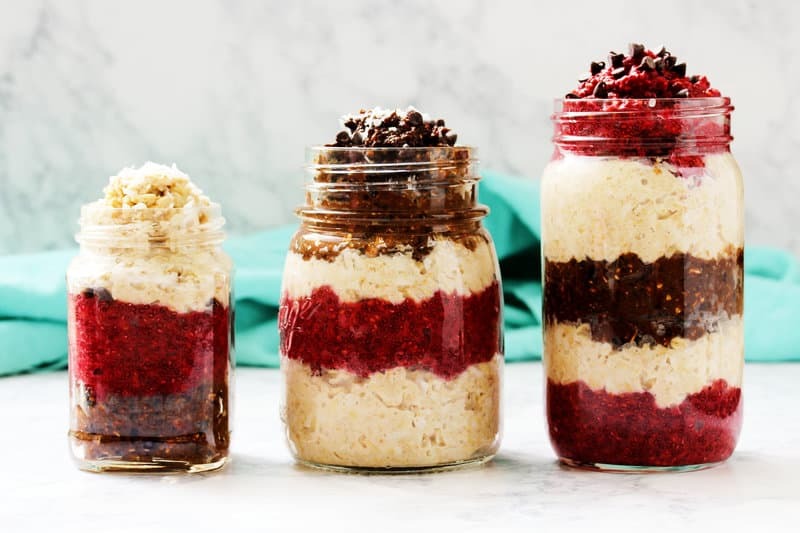 A delicious and nutritious breakfast has never been so easy with these make-ahead healthy chocolate raspberry overnight oats! 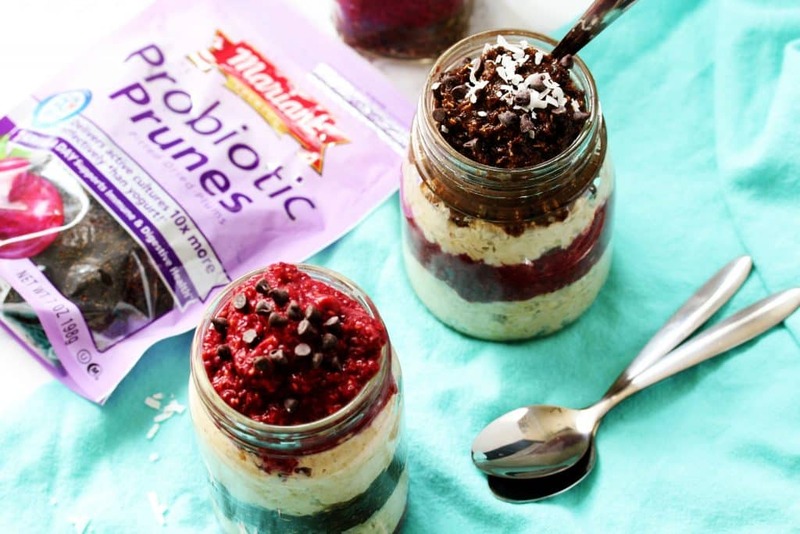 Each layer is unique with a slightly sweet, perfectly chewy, oaty, coconut layer, a fruity raspberry layer, and a sweet and smooth chocolate layer made with Mariani Probiotic Pitted Prunes. Summmerrrtiiiiimmmee and the living is eeeeeassyyy (be glad you can’t hear me singing this as I write it). Except for when you’re an adult and summertime doesn’t mean 3 months vacation but you still want to do all the summery things like it does. Where’s the extra 8 hours in the day to chill by the pool, take a day trip to the beach, and flip through allllllll the magazines? 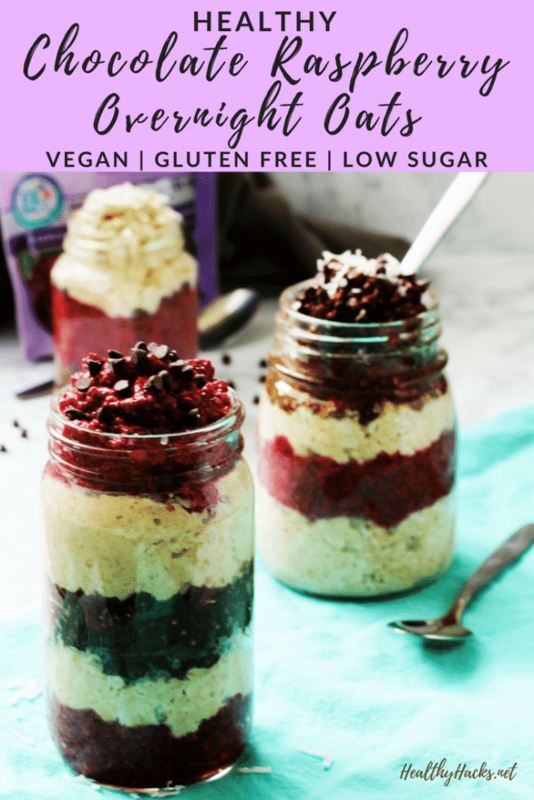 Well, this quick and easy healthy chocolate raspberry overnight oats parfait isn’t going to save you that much time, but it sure is going to make getting out the door in the morning a whole lot easier! 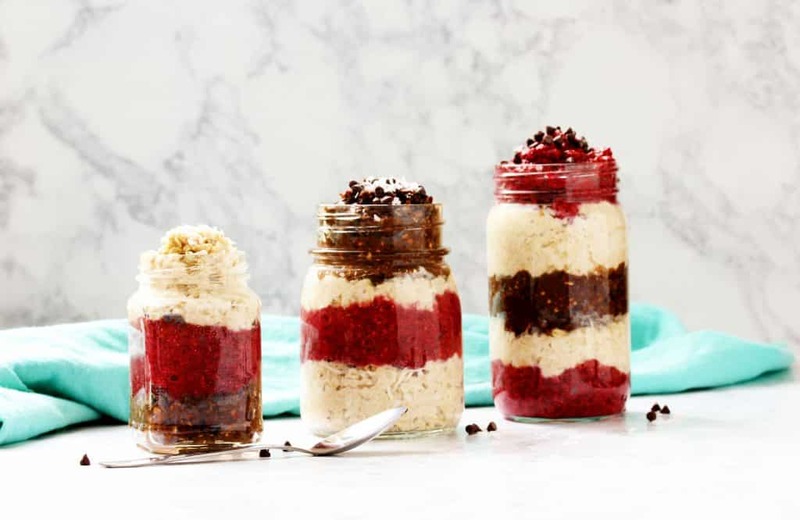 Just prepare these slightly sweet, creamy and chewy, super delicious overnight oats layers the night before you want to eat them or on your meal prep day and you’ve got breakfast done and ready to go for the next few days! They’re also perfect to pack up and take to work for a nutritious and filling afternoon snack. If you love oats, this is the layer for you! Grab a bowl and mix together some old fashioned oats and your milk of choice. Then stir in a good amount of unsweetened shredded coconut, a splash of vanilla, a pinch of salt, and a bit of honey – or any other sticky sweetener you’d like. The end result is a thick and chewy, oaty glob of goodness. This raspberry chia jam layer is super fruity and almost creamy-like. Plus it only takes 2 ingredients! Just dump your raspberries (fresh or frozen, but if you’re using frozen defrost them first) and chia seeds into a food processor or blender and whizz away until smooth. Prunes aren’t just for your grandma anymore! 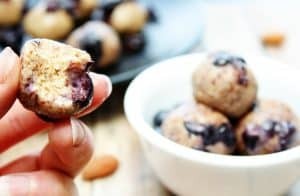 If you’ve never had them or are afraid to try them, I’m here to change your mind! They’re like a sweeter, softer, chewier version of dates. So if you’ve got a sweet tooth, these are the natural fruit-sweetener for you! For this layer, you just add a bag of your Mariani Probiotic Prunes to your food processor or blender (no need to clean it from making the raspberry layer) with some unsweetened cocoa powder and extra oats and you’re done! No need for added sugar with these sweet little goodies around. 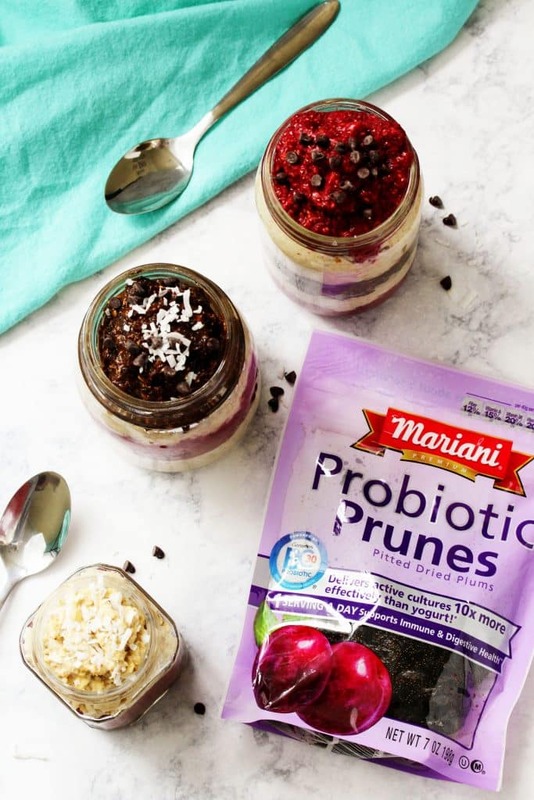 Plus, besides the yummy taste you get from the Mariani Probiotic Prunes (which are made using California grown prunes) they also support overall wellness and digestive health. Mariani prunes are a prebiotic, which is basically the food for probiotics and is needed for these gut healthy bacteria to grow. Prunes are also packed with vitamins like A, E, B6, and B12, which are needed for your overall health & wellness. Mariani Probiotic Prunes have a unique probiotic – the Ganeden BC30. They are designed by nature to survive and thrive in conditions other probiotics can’t. Because it can survive, Ganeden BC30 delivers active probiotics ten times more effectively than the probiotics in yogurt. If you’re interested in learning more about this unique probiotic, check out this video. 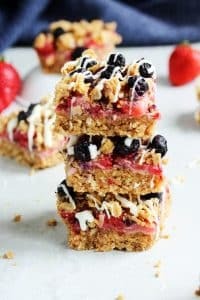 And if you do find a few minutes to relax by the pool with a juicy magazine, these parfaits are perfect to pack in the cooler for a refreshing poolside snack! Have you ever tried prunes before? For the coconut oat layer, in a medium bowl stir together the oats, milk, coconut, honey, vanilla extract, and salt. Set aside. 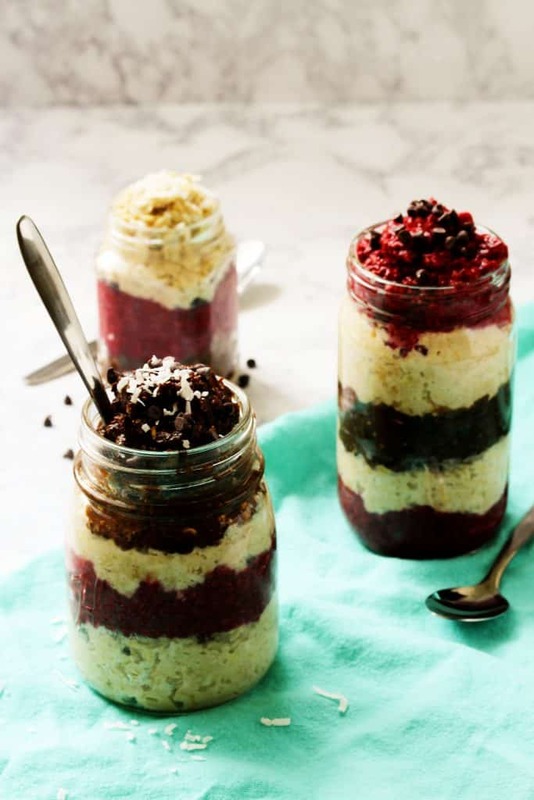 For the raspberry chia jam layer, blend the raspberries and chia seeds in a food processor or blender until smooth. Transfer to a separate bowl and set aside. For the Chocolate Probiotic Prune Layer, add the prunes, milk, oats, cocoa powder, and vanilla extract to the food processor or blender and blend until smooth. Scrap down the sides when necessary and continue blending. Scoop some of each layer into a mason jar, filling it up as much as you’d like. Screw on the top and place in the fridge overnight to thicken. 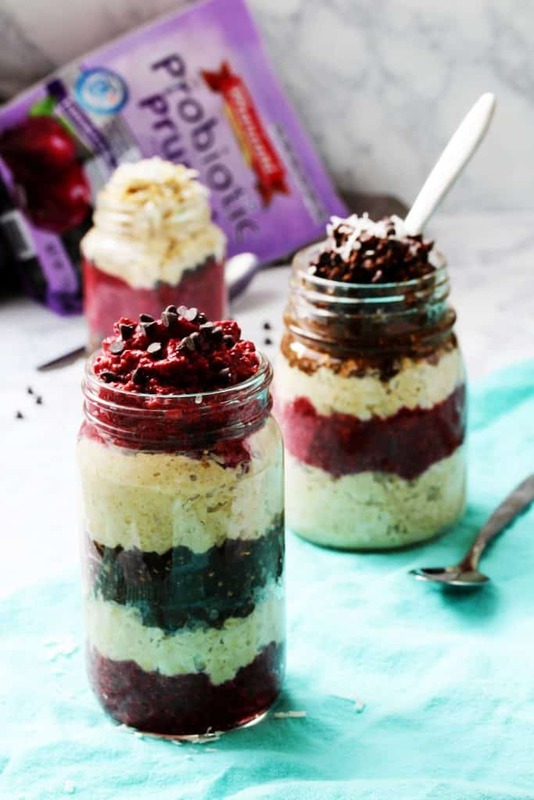 Grab one of your delicious and healthy chocolate raspberry overnight oats parfait while you’re heading out the door the next morning and enjoy!